Electricity markets are structurally different to othercommodities, and the real-time dynamic balancing of the electricitynetwork involves many external factors. Because of this, it is nota simple matter to transfer conventional models of financial timeseries analysis to wholesale electricity prices. The rationale for this compilation of chapters from internationalauthors is, therefore, to provide econometric analysis of wholesalepower markets around the world, to give greater understanding oftheir particular characteristics, and to assess the applicabilityof various methods of price modelling. 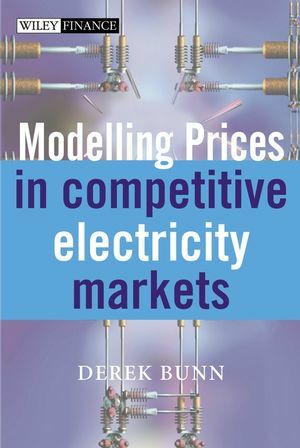 Researchers and professionals in this sector will find the book aninvaluable guide to the most important state-of-the-art modellingtechniques which are converging to define the special approachesnecessary for unravelling and forecasting the behaviour ofelectricity prices. It is a high-quality synthesis of the work offinancial engineering, industrial economics and power systemsanalysis, as they relate to the behaviour of competitiveelectricity markets. DEREK W. BUNN is currently Professor and Chairman of theDecision Sciences subject area and Director of the Energy MarketsGroup at the London Business School, having held previousappointments at Oxford and Stanford universities. As a prominentinternational advisor on energy economics, he has consulted formany global energy companies and advised a number of governmentagencies. Author of over 150 research papers and 9 books in theareas of forecasting, decision analysis and energy economics, hehas also been chief editor of the Journal of Forecastingsince 1984. His research and practical involvement with theelectricity sector extends back over 25 years experience. 1 Structural and Behavioural Foundations of Competitive Electricity Prices (Derek W. Bunn). PART I: PRICES AND STRATEGIC COMPETITION. 2 Competitors? Response Representation for Market Simulation in the Spanish Daily Market (Efraim Centeno Hernáez, Julián Barquín Gil, José Ignacio de la Fuente León, Antonio Muñoz San Roque, Mariano J. Ventosa Rodríguez, Javier García González, Alicia Mateo González, and Agustín Martín Calmarza). 2.2 Hourly bidding-based Spanish electricity markets. 2.3 A two-phase clustering procedure for the analysis of bid functions. 2.4 Forecasting methods for residual demand functions using time series (ARIMA) models. 2.5 Discovering electricity market states for forecasting the residual demand function using input?output hidden Markov models. 2.6 Conjectural variations approach for modelling electricity markets. 3 Complementarity-Based Equilibrium Modeling for Electric Power Markets (Benjamin F. Hobbs and Udi Helman). 3.3 A general complementarity-based model of energy commodity markets. 3.4 A comparison of two approaches to modeling Cournot generators on a transmission network. 3.5 A large-scale application: the North American Eastern Interconnection. 4 Price Impact of Horizontal Mergers in the British Generation Market (John Bower). 4.2 England and Wales wholesale electricity market. PART II: SPOT MARKET DYNAMICS. 5 Testing for Weekly Seasonal Unit Roots in the Spanish Power Pool (Angel Le´on and Antonio Rubia). 5.3 Testing for seasonal unit roots. Appendix B: Critical values of the HEGY test. 6 Nonlinear Time Series Analysis of Alberta?s Deregulated Electricity Market (Apostolos Serletis and Ioannis Andreadis). 6.3 A multifractal formalism setting. 7 Quantile-Based Probabilistic Models for Electricity Prices (Shi-Jie Deng and Wenjiang Jiang). 7.2 Quantile-based distributions and the modelling of marginal distributions of electricity price. 7.3 Quantile-GARCH models and the modelling of time series of electricity price. 8 Forecasting Time-Varying Covariance Matrices in the Intradaily Spot Market of Argentina (Angel León and Antonio Rubia). 8.2 VAR analysis for block bids. 8.3 Modelling the conditional covariance matrix. 8.4 Forecasting conditional covariance matrices. PART III: SPATIAL PRICE INTERACTIONS. 9 Identifying Dynamic Interactions in Western US Spot Markets (Christine A. Jerko, James W. Mjelde and David A. Bessler). 10 Transmission of Prices and Volatility in the Australian Electricity Spot Markets (Andrew C. Worthington and Helen Higgs). 10.2 Data and summary statistics. 11 Forecasting Higher Moments of the Power Price Using Medium-Term Equilibrium Economics and the Value of Security of Supply (Chris Harris). 11.2 Construction of the moments of price. 12 Modeling Electricity Forward Curve Dynamics in the Nordic Market (Nicolas Audet, Pirja Heiskanen, Jussi Keppo and Iivo Vehviläinen). 12.3 Forward model in the Nordic market. Appendix: Estimation of model parameters. 13 The Forward Curve Dynamic and Market Transition Forecasts (Svetlana Borovkova). 13.1 The term structure of commodity futures prices. 13.3 Critical regions and bootstrap methods. 13.4 Application to electricity and oil futures. PART V: FORECASTING AND RISK MANAGEMENT. 14 Price Modelling for Profit at Risk Management (Jacob Lemming). 14.3 A profit at risk risk management model. 15 ForecastingWeather Variable Densities for Weather Derivatives and Electricity Prices (James W. Taylor). 15.3 Univariate time series modelling of weather variables. 15.4 Empirical comparison of weather point forecasts. 15.5 Empirical comparison of weather quantile forecasts. 15.6 Summary of the analysis of temperature, wind speed and cloud cover. 15.7 Forecasting the payoff density for a weather derivative.